This article describes the author’s experience of preparing a text-commentary for the Online Companion to The Worlds of Roman Women. Companion provides a collection of unadapted Latin texts, with hyperlinked grammatical support, by or about Roman women from all parts of Roman society; it also places each text in its cultural and social context. Preparing a commentary with a feminist focus offers a unique teaching resource for Companion’s target audience of intermediate Latin learners because of the otherwise neglected aspects of Roman culture and the Latin language that emerge from this approach. The process of creating such a commentary for Companion has multiple benefits for Latinists at all levels. 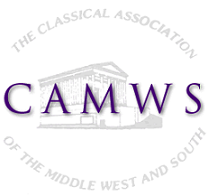 It provides an on-going professional development opportunity for pre-collegiate teachers, graduate students, and both pre-tenure and post-tenure university faculty by maintaining and improving contributors’ proficiency with Latin and enhancing their knowledge of Roman cultural practices and perspectives. The article outlines the process of identifying a suitable text, creating grammatical glosses, and collaboratively editing the commentary into its final form. The article explores the value of Companion as a teaching tool, offers suggestions for classroom use, and encourages others to join the collaborative project of increasing the range of Companion’s texts. Making the Classics relevant in a contemporary classroom setting has been a perennial problem in Latin language instruction for the past few decades. Humor, by contrast, has found increasingly widespread acceptance and direct application in the classroom. This study selects several examples of Latin epigram and satire by canonical authors of suitable difficulty from approximately the 1st century BC to the 1st century AD. These passages are classified by the mechanism of their comedic import. The three main sources of humor are identified as arising from incongruity, superiority, and release. Pedagogical methods are devised to reflect this categorization, enabling students to grasp background knowledge of Roman history and culture by analyzing the corresponding operation of humor. Students will also be encouraged to discern the moral implication of the passages and to relate the lessons to their own experience. In this way, texts will be used to fulfill the Horatian definition of poetry: both delighting students and instructing them. Should all students and scholars of Latin use an oral approach? This increasingly common question is important as we consider whether we as teachers are utilizing the best possible methods for our purpose—whether that purpose be overall linguistic competence, or strictly the ability to read canonical texts. Five motivations for the use of oral Latin by teachers and students of any level are described: deepening the understanding of Latin, developing fluency in reading, offering variety for students of different learning styles, historical success of the method, and motivating learners. This paper delineates these motivations and explores to what extent oral Latin is effective for each. Podcasting helps to bring Latin and Greek off the page through oral performance, and also creatively recuperates aspects of ancient Roman and Greek practices of poetic performance and rhetoric. Even more importantly, it provides an audience other than the teacher. Students take on the role of public scholars, which can positively affect the learning process. A sample assignment is described, deriving from college intermediate level Greek and Latin poetry classes, and examples of student work are given. The assignment involves the creation of a 6–8 minute audio recordings, including discussion (in English) of a poem or short passage, translation, and recitation in the original language. The technical process of creating podcasts is not overly demanding in itself, but the writing and editing of the script is time consuming and must be executed carefully to obtain good results. While this particular assignment is aligned with learning goals not exclusively focused on second-language acquisition, the benefits of podcasting can be aligned with various types of learning goals. This article presents detailed snapshots of a two-day SALVI Latin immersion workshop in order to broaden awareness of immersion workshops and their benefits, to remove misconceptions, and to alleviate fears of what being in an immersion environment is really like. A range of techniques is employed for instruction and illustrated through photos and videoclips, including but not limited to Total Physical Response (TPR), Teaching Proficiency through Reading and Storytelling (TPRS), Comprehensible Input (CI), and Where Are Your Keys? (WAYK). Specific attention is given to the first time immersion participants, including addressing performance anxiety and fear of making mistakes. Students participate in micrologues (orally/aurally) and dictation, build word webs that are used to compose short compositions, write and perform dialogues, engage and activate Latin through oral substitution and transformation drills, read and discuss Latin passages from Caesar and Vergil in Latin, and play a variety of vocabulary building games with white boards. Incorporating these techniques into your own classroom is also discussed. In the last decade, what once seemed a huge gulf between modern and classical language teachers has begun to look more like a practical bridge between helpful neighbors. This paper attempts to illustrate how that professional sharing is engaging Latin and other teachers of classical languages in teaching practices grounded in the theory Comprehensible Input. The considerations include summaries of the theory of Comprehensible Input first articulated as five hypotheses by Stephen Krashen and subsequently supported by other researchers such as Lee and VanPatten. Illustrations of the practice of CI come from the author’s work in his secondary school Latin program via written and video examples of the work, shared lessons, assessments, and commentary on them. The paper considers a range of approaches from core practices to strategies for reading, writing, and assessing.